If you don’t like having water tubings in your hood, or if you want to save water, ECooler is an ideal tool for you. It needs only connection to power outlet. Temperature of the inner surface of the condenser can reach up to -10 °C, so refluxing dichloromethane or ether is no longer a problem. Are you tired of oil bath creating mess in your hood? 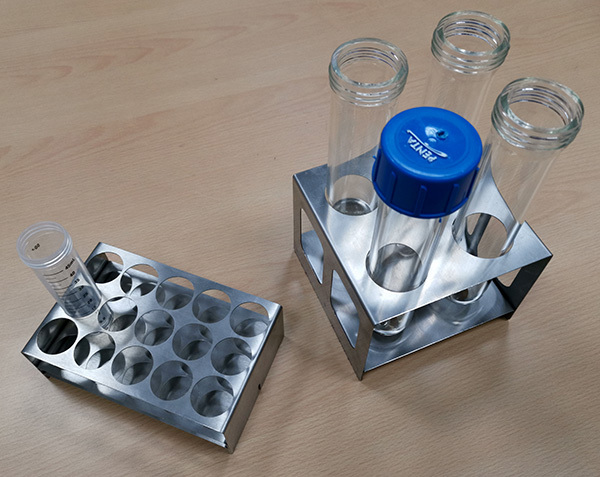 Try the aluminum heating, which is available in number of standard sizes, but which can be custom made for any container you can imagine – from miniature Eppendorf and Falcon tubes up to 2L flasks. It is compatible with any heating platform (e.g. IKA) and it is ready to accept the appropriate feedback sensor. You can design your own holder for vessels of any imaginable shape and size with any possible layout. 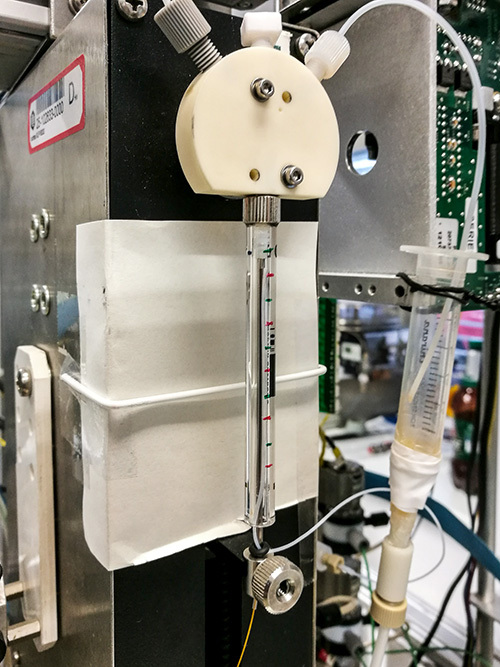 Well packed column for liquid chromatography can be tricky. 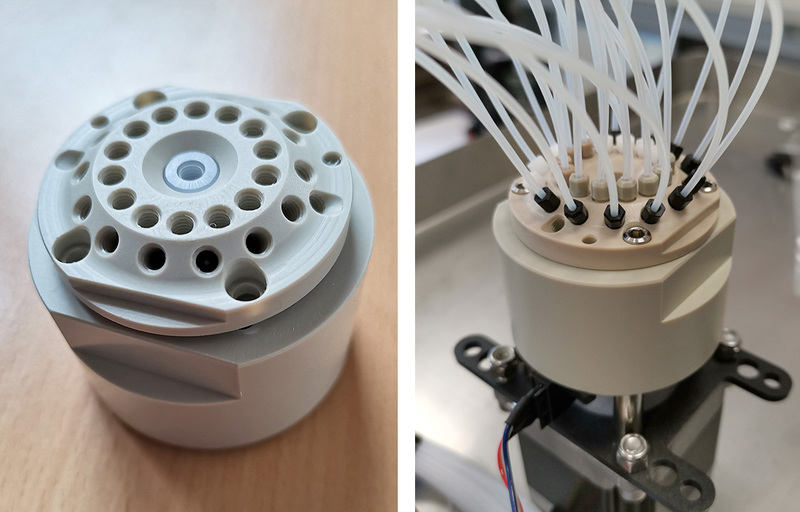 Our modification of standard plastic column with inclusion of spring loaded distribution system improves performance and reproducibility of separation in both classical and reversed phase chromatography. 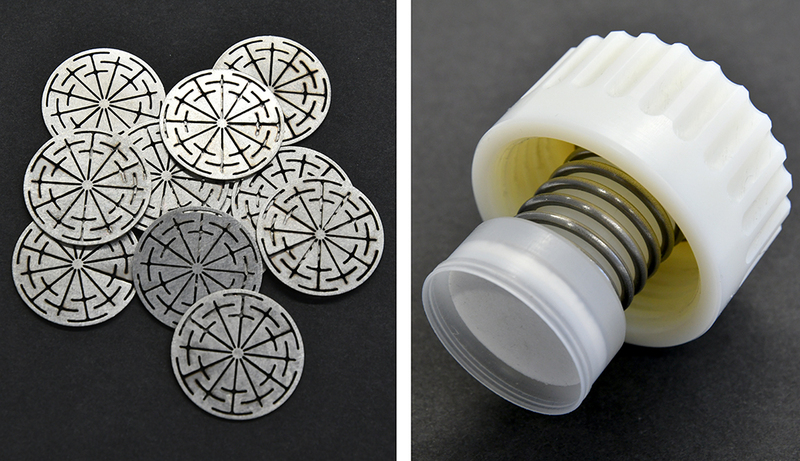 Further improvement of separation is achieved by inclusion of liquid distribution inserts. 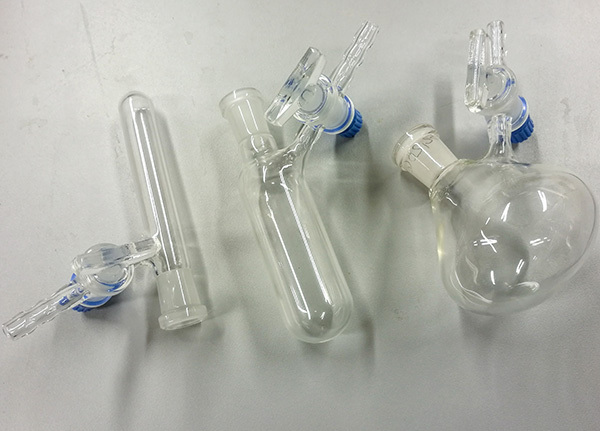 Holder for small glass column cartridge which can be quickly replaced can be used in various applications (precolumn in chromatography, drying cartridge, solid phase synthetic compartment, etc.). Alternative to commercially available plates. These plates are customizable as the location of bead targets (side wall or bottom) and color of the plate (allowing easier visual inspection). Inlets of liquid handling instruments are customarily protected by filters to prevent damage of sensitive surfaces of the valves and pumps. Our Teflon based filter assemblies allows very simple maintenance of filters attached by compression. 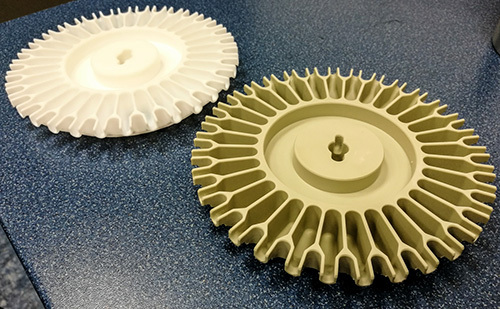 Filter materials can be classical porous plastic, or metal sheets with drilled micro holes. Typical metal sheet filter has 144 holes with 70 µm diameter. 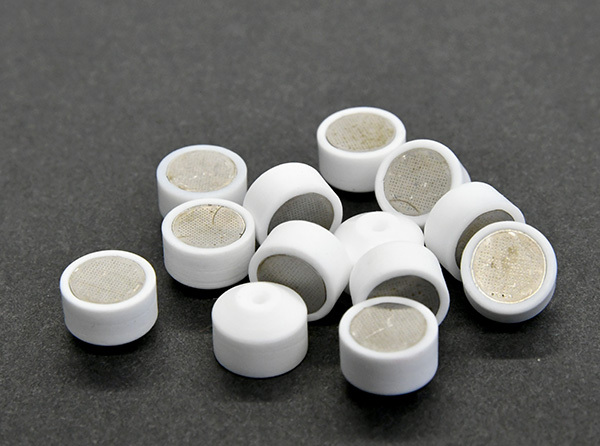 Advantage of micro hole filter is its small dead volume, resistance to clogging, and very simple cleaning. 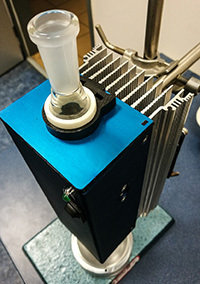 Small volume photoreactions are conveniently realized by immersing the light source into the reaction vessel or placing it in the optimal location and focusing the light. However, the heat generated by the light source is sometimes undesirable in the irradiated compartment. 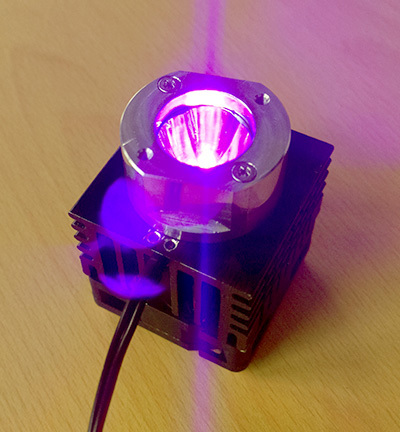 The use of the simple waveguide separates the heat generation from the light output. 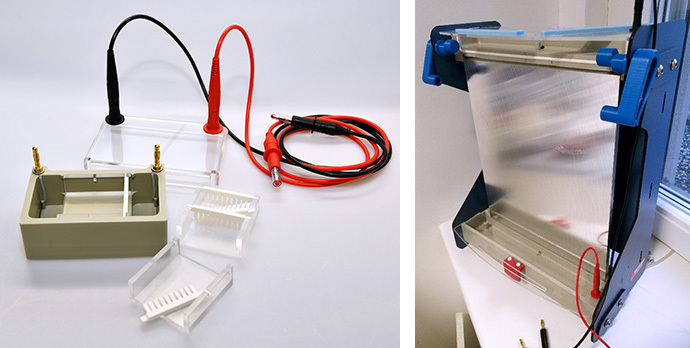 From microtiter plate size up to extra-large bench top systems. 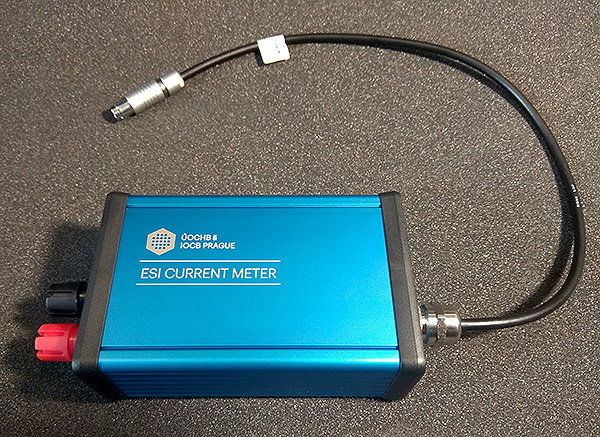 UV detector which is (a big) cellphone-size and can be attached to the outlet of the column and chromatography progress followed on any Bluetooth-enabled instrument (cellphone, tablet, computer). Your cellphone can ring when appropriate time has passed or when the peak is coming (that could be too late, when you are actually at the cafeteria). Serves as a bridge between commercial lab instruments. 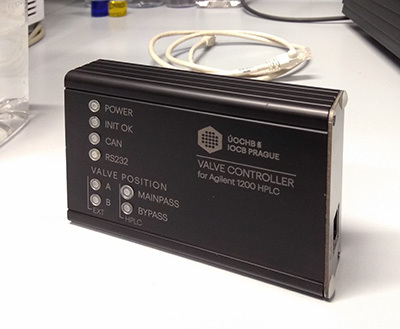 Communicates over CAN bus on HPLC side and synchronizes with external valve over RS232 interface. 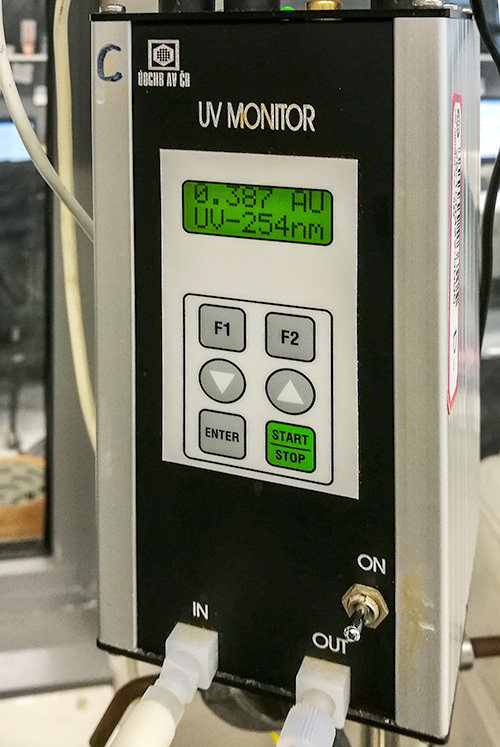 High voltage nano-ammeter for measuring electrospray ionization current in mass spectrometry. It can operate at up to 4500 V and measures current in 50 nA to 1000 nA range. This low-pressure valve can be used in automated instruments requiring delivery of many individual solutions. 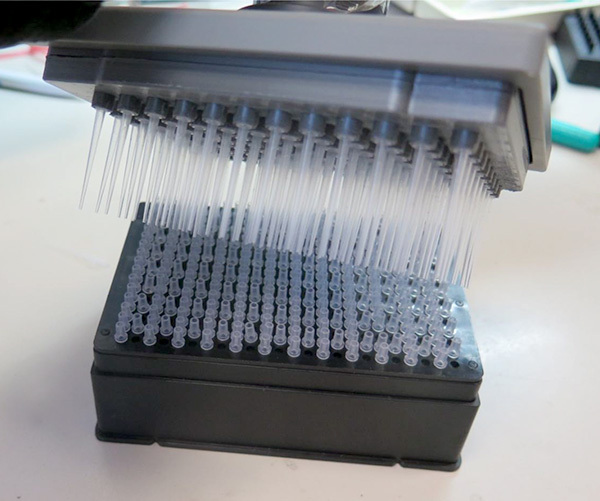 It was originally developed for multiple automatic peptide synthesizer. This valve is based on the novel internal fluid path, preventing the danger of cross contamination between individual inlets. Sometimes you need to place many liquid connectors in a close proximity and classical 1/4 28 fittings are too large (and expensive). You may consider this new system of 4 mm nuts with flanged endings allowing for super tight connections. 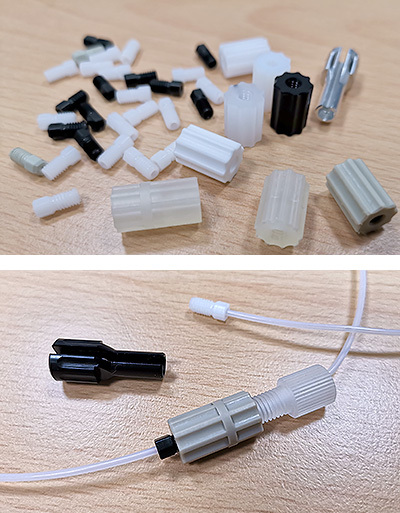 All kinds of connectors and adaptors (to 1/4 28, luer, etc.) are available on request. If your system asks for a lot of connectors of any kind, you may consider getting it from us instead from Cole-Parmer. Falcon tubes may be ideal containers for your reaction or solution storage. Now you can easily arrange any number of Falcons and connect them with any number of inlets and outlets into the system of your dreams. If polypropylene can handle your media (solvents, gases) then this system may replace very expensive glass lines. Pipet tips are delivered in the boxes containing 384 individual tips. In certain applications, however, only arrays of 96 tips are needed. This simple tool allows for a very simple reformatting. In some application of the commercially available computer controlled syringe pumps (Cavro, Knauer, Hamilton), it is desirable that the inputs to the syringe are directed from the valve located at the head of the pump, but the output is directed through the syringe piston (glass capillary threaded through the piston). This arrangement allows the use of the entire internal volume of the syringe without cross contamination with minimal need for washing the syringe. It may be important in the applications utilizing microliter amounts of extremely valuable solutions. The syringe surface under the piston is constantly flushed by inert gas (Teflon tubing). 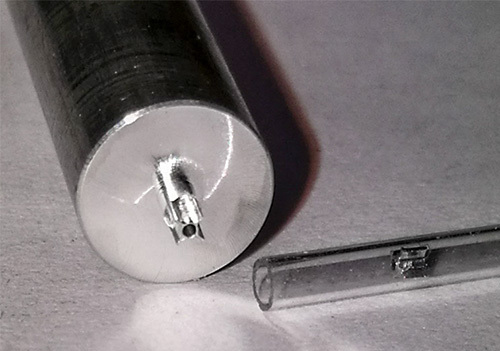 Probably our smallest products are the capillary inserts for creation of coaxial arrangement of quartz and glass (or plastic) capillaries needed in mass spectrometers. (An example of the small-scale manufacturing capabilities of our machine shop – ID of the glass capillary in the picture is 0.7 mm). Distribution rotor is shown here as an example of an intricately custom-designed component produced with high precision on the CNC machine. Our glass blowing workshop can produce any apparatus you may dream up. Just submit your drawing and we will try to make it. 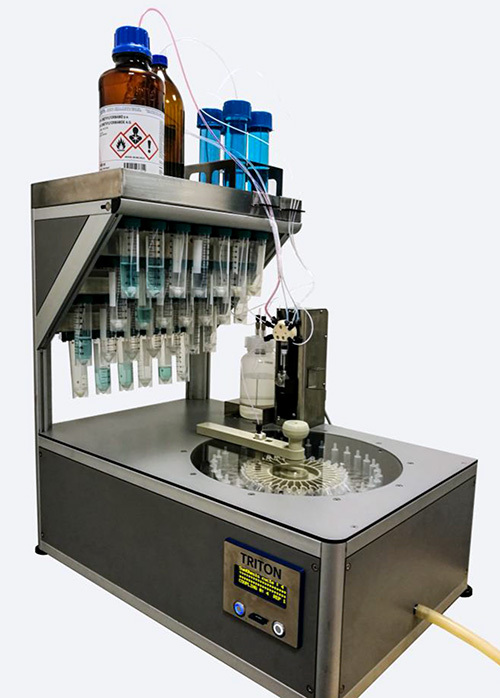 Our synthesizer combines the elegance and flexibility of synthesis in plastic syringes with efficiency of centrifugal liquid removal and simplicity of liquid handling resulting in very inexpensive completely automatic instrument. Synthesizer can handle simultaneously up to 18 10 ml or 33 2 ml reactors (syringes). Any type of solid support can be used and both Fmoc and Boc synthesis can be applied in this machine since the synthetic compartment is separated from the environment and can be kept under constant flow of nitrogen. 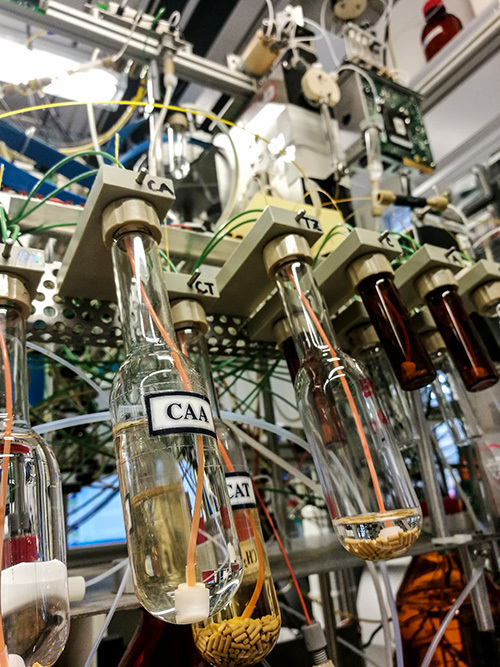 Automated machine for the synthesis of analogues of DNA with the use of synthetically modified building blocks. Reagents which are very precious and available in very small quantities are utilized with extreme care and minimal wastage. All liquid connections are realized by glass capillaries with negligible dead volume. 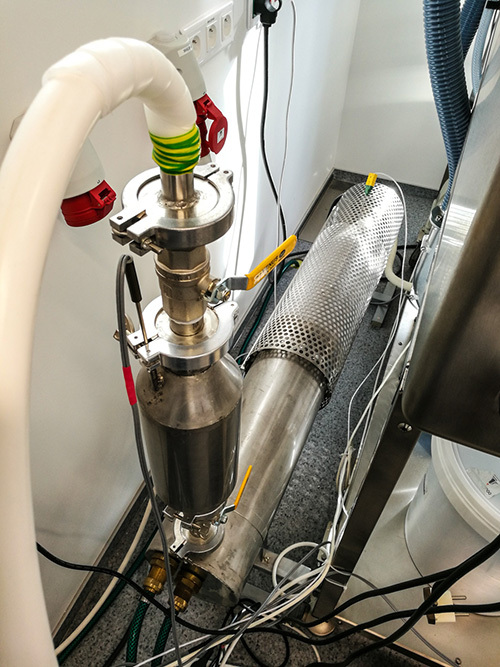 Instrument for catalytic oxidative destruction of tritium after use in reaction chamber to prevent contamination of the laboratory with radioactive isotope. 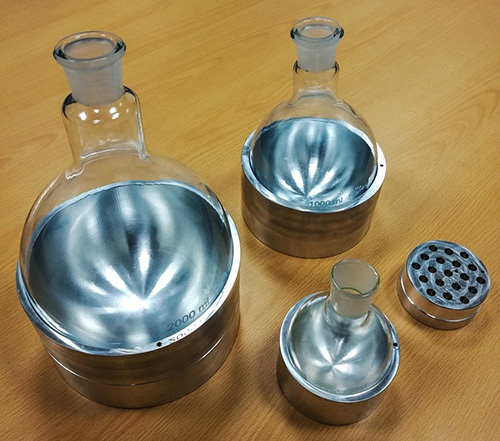 It is based on high temperature catalytic conversion into water, rapid cooling of the water vapor and its adsorption on molecular sieves.